So a bit of a bloodbath. 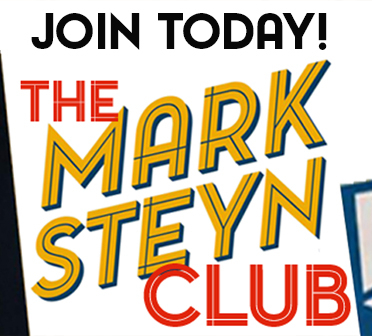 If you prefer Mark in non-visual form, later today, for members of The Mark Steyn Club, he'll be launching a brand new nightly audio adventure in our series Tales for Our Time. We hope you'll tune in! 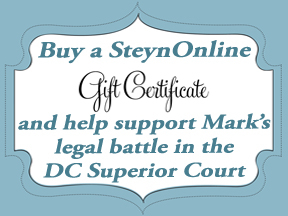 For more on membership of The Mark Steyn Club, see here - and, if you're antipathetic to Mark but need a holiday present for the Steyn fan in your family, check out our limited-time-only Christmas gift membership, including your choice of a personally autographed welcome gift from Mark. More details here. 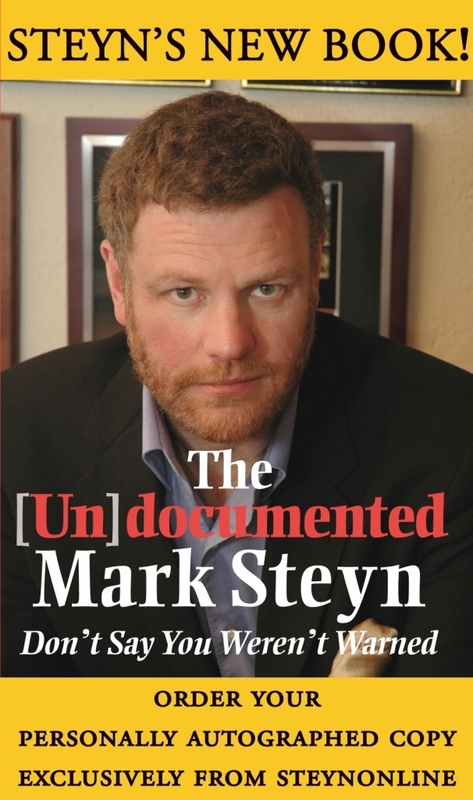 I felt like revoking my membership in the Mark Steyn Club after that humiliating drubbing. Just kidding! But I can't understand why Mark would guess about answers to questions he hasn't a clue about. I can understand guessing at multiple choice questions when wrong answers don't give you negative scores but making wild guesses that pile up negatives is not wise. The men that participate in the silly quizzes seem to be afraid of losing to a female, so they jump out of the starting gate with uninformed answers that will be impossible to recover from in time. Fortunately, Mark was only participating in a silly forgettable quiz and not trying to solve the North Korean nuclear situation. Otherwise, with Mark's propensity to make wild guesses we might all be bathing in nuclear radiation. I expected Mark would do poorly in this quiz because I suspect he doesn't take the time to watch trivial things or even some interesting, personal interest events like Trump's trip to Asia. Mark plays silly quizzes as well as he throws Hannity's football. By avoiding sports and silly trivia that dominates the minds of many others, Mark is able to brilliantly focus on the really big important issues "IMO." 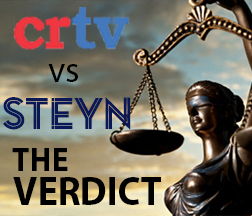 I think Fox likes the lighter side of Steyn but I wish they would wise up and put on a show like the CRTV gambit. 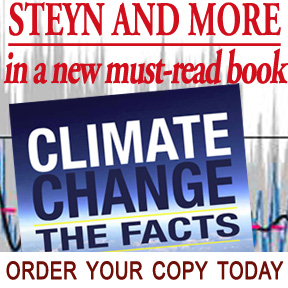 Insightful and intelligent interviews, accomplished guests, interesting backstories. I cringe when Tucker does this routine. Nerd Travelers, eyes glaze over when you share your trip through I-Mac and PC world. Is anyone more detestable than Smug, Grinning, Prog Zimmerman when he pops up on the TV screen. My eyes start bleeding with venom when his lips start to move. Is it just me? Zimmerman is detestable and what's worse, he's got Bob Dylan's name. I am curious as to why you looked at A.B. NOT ONCE during this entire segment. You returned not a single maidenly glance. Trying to avoid her intimidating stare? That is a good question Liz. I never noticed that until you mentioned it. Avoidance seems to be common on the Greg Gutfield show where the regular co-hosts like the always scowling hulking bodyguard and the blonde comic never seem to interact at all or laugh at each other's humor. You know...you're right! I hadn't really realized THAT. On that show, it seems to be a stylistic thing, if it could be classified that way...You know, crack a joke, keep your face straight, and somehow you're funnier. And still, with A.B. 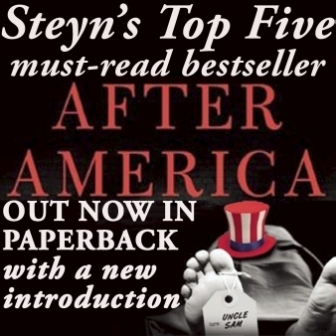 and Mr. Steyn, A.B. was clearly thirsty for a glance exchange. She kept looking at him...and looking at him...and looking at him- And he kept not looking, and not looking, and not looking. Interesting dynamic! He's cowed by her constant unwanted advances ... a problem I, and no doubt Mark as well ... have to endure as the price of being so manly. 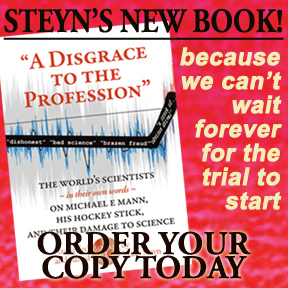 Lol - and let's face it, a wise move on his part (and yours, I'm sure) given the current Salem Lech Trials. 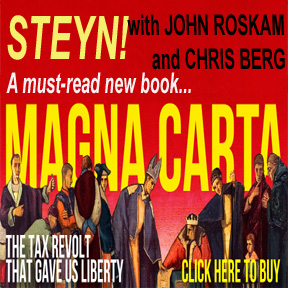 I think you people are missing the point or the obvious question: why not the Mark Steyn Show on Fox? A weekly hour of insightful commentary, interesting guests, and good music would be most welcome. 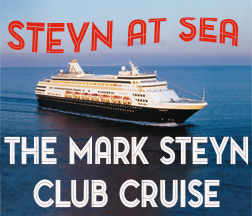 Some see a world without a Mark Steyn Show and ask why. 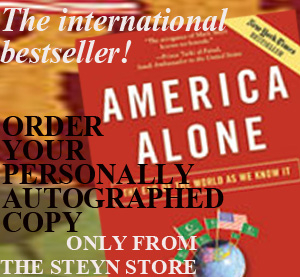 I see a world with a Mark Steyn Show and say why not! I don't know if any of us is missing the point. It's a little tough in short-attention-span USA. Wow - A city conceived, designed, built and presumably run by Bill Gates. How many sci-fi stories and dystopian novels have been based on this concept? Which way will it go? Will Gates use this techno-burg to replace everyone who visits with robots ("Westworld") or will he control the population by injecting them with mico-chips to control their actions and emotions (Dean Koontz, "Midnight.") Or will Gates have his consciousness downloaded into the operating systems to eventually take over the world (Start with the cinematic version of "The Lawnmower Man" and work backward and forward.) In any event, I will give Gates Corners a wide berth until his android agents come for me. Heh-heh. Maybe he'll protect it from malaria with his 'mosquito laser' loftily described as the 'star wars' village mosquito shield. Unbelievable. look it up. Cheap oil mixed with cheap kerosene wiped out yellow fever and malaria in endemic zones by quickly destroying Aedes and Anopheles mosquito larvae in water, results lasting 100 years, but nooo, in the age of Gates, it needs a complicated and expensive computer program to really fail. The mosquito laser went into the drawer or into something else, maybe in part because a leading malaria researcher inconveniently pointed out that if Gates intended to deploy these super high-tech zapper 'shields' in African villages, where were the outlets into which to plug it? After the 'mosquito laser' presented in 2010 to great fanfare, vanished from sight, one might be able to argue quite convincingly that the Gates power couple husband-wife team throwing their combined weight into pesticide-loaded mosquito bed-net promotion to 'control malaria' has been a debacle, from destroying fish stocks to mosquito pesticide resistance problems to giving Africans toxic skin reactions. Did all the fellow 'philanthropists' consult an actual pesticide expert before doing everything the pesticide regulations say not to do? Doesn't look like it. Maybe they all did, but decided, "Pish-posh!" Next anti-malaria Gates funding project, already in the works? 'Eaves tubes." The cheap PVC and netting invention of the very same malaria researcher who pointed out the lack of electricity for the zappers. Only $10 million to try it out. Stop! Stop already! And gads! If these high-tech types think they're going to live until 160 years, they better start eating real food instead of counting on Dr. Frankenstein and his creepy-creepy-crawly head transplant stunts. Amazingly, C.S. Lewis actually predicted this decades ago in his book, "That Hideous Strength' part of his Space Trilogy series. I remember when Bill Gates asserted that, if car technology had evolved as fast as computers, you'd be able to get to the Moon and back on a single gallon of fuel (or something along those lines). Somebody riposted that, if a car were like a PC running Windows, it would crash six times a day. The idea that Gates is now championing driverless cars is alarming. I trust, for the sake of the rest of Arizona, Gatesville is going to be a gated community, with the gates locked from the outside and preferably with Gates himself on the inside. At least in his book The Road Ahead, Bill Gates acknowledged that it was certain that he would be wrong about some of his conceptions of the future, something missing in present futurologist claims. Stephen Hawking thinks humans have 100 (could be 98 by now) years left on this planet. Elon (which sounds like an alien name) Musk thinks that unless we colonize other planets, humans have no future. 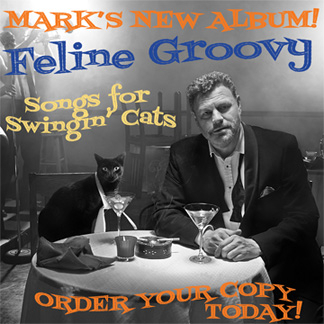 I just listened to your delightful reading of "The Cat That Walked By Himself" with my kids, and I'm surprised you didn't go with man's first friend, "Feline Groovy" notwithstanding! How can we be sure that the questions weren't leaked? We wouldn't want either side to be 'blindsided' now would we? So sorry Mark, but a valiant effort. Maybe there is a mouth-breather mug in your future. Ask Santa. I think you took a knee, Mark. That aside, why has no one mentioned that Tucker C. stole the quiz kids idea from Bill O'Reilly? There is nothing more enjoyable to a smart woman than a brilliant man. 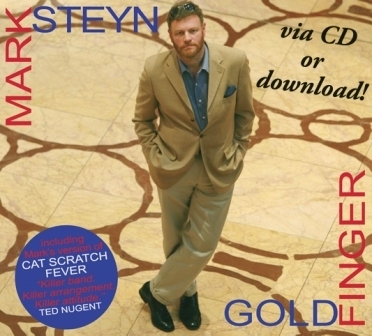 Mark Steyn is without doubt just that. He is quite entertaining as well. All intellect, no fun does not make an appealing combination. So, Tom in Missouri, give us ladies a break when it comes to those funny moments with Tucker. There are so few laughs available to us in this crazed culture, please let us have this fun moment. After all, we appreciate guys like you as well. My cup throughout my life has been half full. I enjoy waking up in the morning with a smile, getting to the coffee machine as fast as possible. So, thanks to Mark and guys like you, the world is still my oyster! My "slam" has to do with the veering into nonsense on Tucker's show; not at all directed at Mark. After all, I too viewed it. Why? Because I too enjoy a 'break' when Mark appears on Fox. I also view Tucker's show, unless it conflict with the home team's hockey game! Tucker's show was not meant to be a novelty act nor a variety hour. I particularly enjoy the manner in which he dissects and bisects a lefty - luv it. Many thanx for making your point in such a civil manner. Nice. Hi Darlene! Who needs coffee any longer? The process of getting the coffee grounds and water combined to make coffee appear in my cup now takes valuable time away from keeping up with all the suggested reading, listening, cogitating, chuckling and commenting. I enjoy the camaraderie here immensely and I hope I don't get shown the exit ramp for an occasional objection to this or that. Yes, your point is well taken. Life without levity is life in a straight jacket. Who needs that? Liberals, perhaps! By the way, I miss your articles over at Taki's. Aw, thanks Clark! Yes, I'm on hiatus at Taki's, with an open invitation to return. After many years there, the stress of combining a 12-14 hour a day job with a weekly column was too much. And I felt like I was running out of things to say. I'm enjoying catching up on my reading (and banked TCM movies on the PVR)! PS: If you REALLY liked my Taki's columns, well, a collection of them may be in your future :-) Stay tuned! At least everything would work (please forget the virtually 100% in field failures of the Apple IIIs) and we wouldn't be blue screened to death. However, having Jobs as master would drive everyone nuts as perfection would be the order of the day, the night, the weekends and no holidays or vacations. I still have my Apple II (2nd release) from 1978 with its 16K Mountain card that boosted onboard memory to 64K! Plus the AppleSoft card that was added to give floating point capability rather than just integer. Note: Watch "Triumph of the Nerds" by Cringely for all the history of personal computing. Indeed! People who haven't used an Apple in years may not realize how much it has improved, either. I miss that little smiling Apple start screen btw. My newish iMac is super fast and stable, as is my laptop. One of the only things my husband and I have always argued about is PC vs. Mac. He calls mine my Easy Bake Computers. And yes, Triumph of the Nerds was fun, and if you don't mind a lot of corny artistic license, there's always Pirates of Silicon Valley. But I've never watched any of those recent Steve Jobs bios. They look horrible. Ah....the days of System 7 and before....such memories. I have three workstations and have drifted into HackIntosh territory. I was building a computer for system's control back in '78 and was looking at Seattle Computer at the same time frame Gates, Allen and Balmer bought QDOS. So much has happened and the power to follow do much is now in our hands. As long as one is grounded in reality...these tools can do do much. The danger is to slip into a virtual world of no consequences and no real failure. Life's lessons will not be found in silicon. Always enjoy viewing you on TV . . . However, this nonsense of Tucker's is well below my threshold of expectations from his show. Utter nonsense sez moi. I know, I know - different strokes for different folks. This "folk" is rapidly becoming a "former Fox viewer." Not there yet - but getting c-l-o-s-e-r. I know, I know - tell it to Fox. It pains me to say this, Tom of Trains in Missouri, but it is as you say for moi aussi. I would rather that Tucker just shoot the breeze with two new buddies each week. I can't help but get that Hillary Rusky reset button out of my mind when I see those big plastic buttons. I feel as if I get dumb and dumber each time he has that segment. The potential brain drain can be worrisome at my age. Good "seeing" you again . . . thought perhaps your slingshot failed you and those varmints had you cornered! As for Tucker's show: Yeah, that would be a nice respite from the "norm," I can go for that. However, the nonsense with the "quiz show" is a huge turn-off in my not-so-humble-oh-pin-yun. Therefore, when that segment comes up, I change channels or shut the danged TV off. Braaaaatzafraaaaatz, I say. Your age? Ha - how about "our" age? At any rate, we seem to be staying ahead of the curve along with above ground. Yeah, Tom, just coming up for a little fresh air! I've been taking five (reminds me, I haven't listened to that Dave Brubeck song in some time, need to turn the volume up; been some kind of depressing week, ugh!) 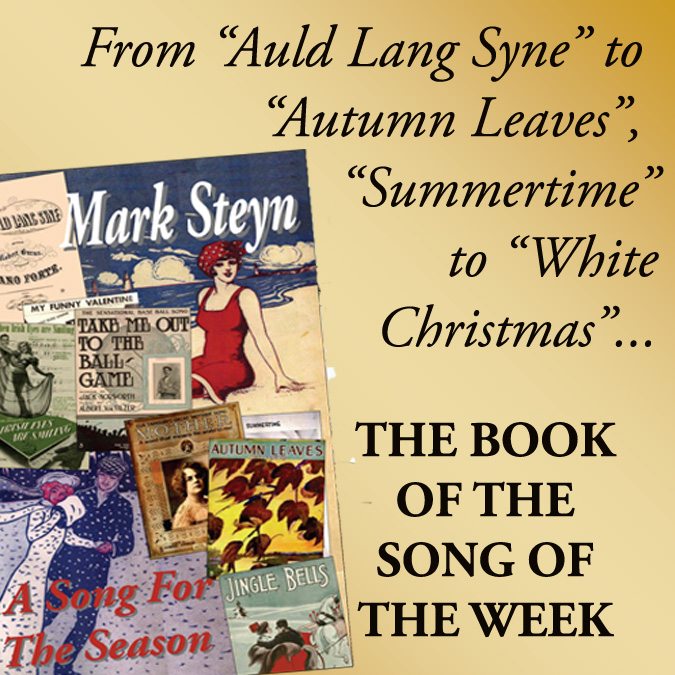 and have been reading Mark's "Lights Out" and debating whether it's too soon to start ordering my MS Christmas cds yet. Bumped into a guy in the grocery line short of cashiers while waiting (im)patiently the other night, and we got to talking about how Christmas can't come too soon this year, guessing news has been depressing everyone everywhere. He showed me his Christmas song list is all ready to go in his smart phone. (I didn't see Marshmallow World though). It got me thinking about our little humble abode as kids in Philadelphia with the endless play with the toy trains and tracks under the tree, the bitter cold winters and blizzards dumping snow so high you couldn't see through the windows on the front porch. But that was then, just a kind of winter daydream and now all those plummeting temperatures have been erased from the Wikipedia temperature charts thanks to William Connolly. Yes, all those bitter cold winters just a fabrication of my imagination now. The rats in the greenhouse! Double ugh! This summer it was War! Have a good one! See you 'round the bend!